Volumes can be written on batteries. If you want to understand exactly how they work and are constructed there are plenty of resources available on the web. One of the best sources for general battery info is http://www.uuhome.de/william.darden/ This section looks at batteries from a practical view, as used in an RV. Deep cycle batteries used in RV systems are all lead-acid type. Ni-Cad and NiFe (Nickel-Iron) batteries are sometimes used in industrial applications but are not well suited for RV use. There are basically four types of lead-acid battery construction; flooded (wet) cell, sealed flooded (maintenance free), gel, and AGM (absorbed glass mat). 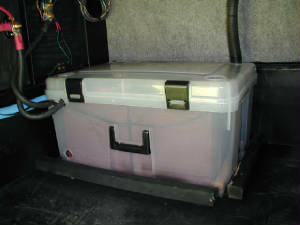 Flooded batteries are your normal batteries used in cars, and in most RV’s. They can be deep cycle, or “starting” type, and can be “sealed” or have caps on them so that water can be replaced. All gelled and AGM batteries are sealed. All the batteries used in RV “house” applications should be deep cycle batteries. NOT marine or starting batteries. SLI, or starting batteries, are designed to supply high starting current for brief periods of time. With many relatively thin plates, they are designed for many shallow cycles, and to maximize the current available for a brief starting cycle. In a starting application they are discharged less than 10%, and can last for thousands of cycles. If deeply cycled, they will last as little a 30-50 cycles. “Marine” batteries have slightly thicker plates and perform a little better than starting batteries, but they are usually not true deep cycle batteries. Both SLI batteries and Marine batteries are usually rated in CCA (cold cranking amps). Deep cycle batteries are designed to be cycled at 50% or more for many repetitions. They are differentiated from the starting and marine batteries by the thickness and construction of their plates. This is what enables the many deep cycles. True deep cycle batteries have solid lead plates and are quite heavy. “Golf Cart” batteries are not quite true deep cycle batteries like L-16 or industrial batteries, but are somewhere in between. From a practical perspective they are considered deep cycle. There is sometimes debate in the RV community on whether to use a bank of 12-volt batteries for the house system. Most experts recommend against this. The argument used in favor of 12-volt batteries is that if one fails you only need to replace the single battery. With 6-volt batteries they have to be used in pairs (combined in series to make 12-volts) and if one battery in the pair fails you need to replace both of the batteries. That is because a new battery, paired in series with an older battery, will be rapidly brought to the same charge condition as the older battery. In other words, if you leave the old battery in the pair, you get 2 old batteries. This mainly applies to batteries older than 3-6 months. The main argument for the use of 6-volt batteries is that they perform much better. It is difficult (but not impossible) to find true deep-cycle 12-volt batteries, so the lifetime and performance of the bank will generally suffer with 12-volt batteries. 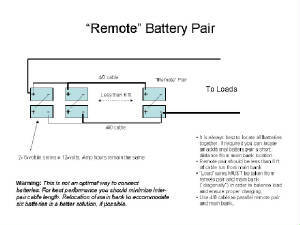 If you do decide to go the 12-volt route, look into using 8D truck batteries (if they will fit in the space available). These are available in a deep-cycle version (about 200 Ah), and will perform better than most other 12-volt batteries. There are true 12-volt deep cycle batteries, but they are harder to find, and are expensive. I prefer to stick to readily available 6-volt golf cart batteries. Golf cart batteries last 2-5 years in RV use, gelled cell batteries last 2-5, and AGM’s last 4-7 years. This is typical use; it can be less or more, depending on treatment and how often they are cycled. True deep cycle batteries can last far longer, but are difficult to use in RV’s, because of space and weight considerations. For example, an L-16 battery easily lasts 4-8 years, and large forklift batteries can last even longer. Large single cells used by the telephone companies for backup power can last for over 20 years in that application (because they are usually not cycled often or deeply). The manufactures publish tables of the number of cycles you can expect at different DOD (depth of discharge) for their batteries. We know people who have gotten over 5 years from Sam’s Club golf cart batteries. They treat their batteries well (no deep discharges, proper watering, and regular equalization), and they are lucky. We currently have over 3 years on our bank of Sam’s Club batteries and they are still performing within specifications. But we know we are on the downside of their lifespan. When comparing batteries in places like Wal-Mart or Sam’s Club you can determine the better battery by its weight. Assuming that they are the same “group” then the heavier battery will be better, because it has heavier plates. Compare a Trojan T-105, T-125 and a T-145. The T-105 and T-125 are identical in size (they fit in standard Group 27 battery boxes). The T-105 weighs 62 pounds and is rated at 225 amp hours, compared to 66 pounds and 235 amp hours for the T-125. The T-145 has the same footprint but is 5/16 higher. It weighs 72 pounds and is rated at 244 amp hours. Of course, there is a price difference among them. You get what you pay for in batteries. The best deal I have ever seen on new T-105’s is $55, in 2003. In January 2005, you could buy the same “class” golf cart batteries at Sam’s Club for $48 each (220 amp hour rating, generally made by Excide or Trojan). If you have the space and can carry the weight, the Trojan L-16H weighs 121 pounds, is rated at 395 amp hours, and measures 11 5/8 x 7 x 16 11/16 high. Don’t ask me to help you put these in, though. Sometimes you can find “deals” on flooded–cell batteries that have never been put into service (e.g. they are “dry”). Be careful with this. Even though batteries are shipped dry, and stored dry, they still have a little moisture in them. They do deteriorate in this state, so check the date of manufacture on the battery. Don’t pay full price for a flooded-cell battery that is over 18-20 months old, even if it is “dry”. You will not get full life out of such a battery, but it may be worth the price charged. We once bought T-105’s that had been dry stored in a battery warehouse for 2 years. They tried to sell them at full price, until we pointed out their manufacture date. We got four of them for $115 with no tax, so it was worth the risk. They did charge to specifications and load tested to spec. They lasted almost 3 years. Your battery bank is going to be charged by multiple charging sources, depending on your setup. Your tow vehicle, or motorhome engine will charge your batteries when you are moving. As discussed elsewhere, this is not going to provide a very good charge unless you set up a sophisticated engine charging system, but it will top them off if the bank is not at a high state of discharge. If you install solar panels then the solar regulator provides the primary charging source for your battery bank. This provides the best charge, since it is multi-stage and slow. Most solar regulators also have an inbuilt mild equalization effect by design. Your inverter/charger has a high power battery charger built into it which is great for a quick charge of a depleted battery bank. This is the fastest way to get your bank restored when boondocking. Lastly, if you leave your converter wired into the system, then under certain circumstances you can also use your converter as a charging source. Batteries can only “take in” so much amperage during charging without being damaged. Flooded cell batteries are usually charged at C/3, where C is the 20-hour rating for the bank. Thus a 440 Ah bank can be charged at greater than 100 amps (usually the inverter max). Gel batteries must be charged much slower, at C/5. AGM batteries can accept much higher currents during charging, so are fully charged much faster (an advantage when boondocking and using a genset or solar to charge). Lifeline AGMs can be charged at almost any rate you can push at them (up to Cx4). Optima batteries are typically charged at Cx2. This is a significant advantage to AGM’s as compared to flooded cell batteries. Both the inverter/charger and the solar regulator contain battery chargers that should be using a Pulse Width Modulation (PWM) charging algorithm. This breaks the charging cycle into three phases (some manufacturers say 4 or 5, but these are just variants of the 3 stage PWM cycle). Do not buy a charger that does not use some variant of PWM. Your inverter and solar regulator manuals will cover these in detail. I’ll summarize them here. The three charging stages are Bulk, Absorption, and Float. Stage one of the charging cycle is bulk charging. During bulk charging the batteries are charged at a constant current. The current is determined by the maximum charge rate set by the inverter. Voltage rises during this phase until it reaches the bulk charge voltage set for the battery type. For flooded cell batteries this is typically 14.4 volts, for gel cell types it is 14.1 volts. If temperature compensation is being used, this will vary based on the battery temperature detected. The batteries will start to gas when the bulk voltage is reached. Bulk charging restores about 75% of capacity. Once bulk voltage is reached the charger enters the Absorption Stage. During absorption the current is gradually decreased at whatever rate maintains the bulk voltage setting (just below the gassing voltage). If voltage starts dropping then current is increased again until voltage remains constant. The absorption stage ends when the current required to hold the voltage at the bulk setting declines to the setting programmed into the inverter. This is often C/40, where C is the total Ah rating of the bank (so for a 440 Ah bank it is about 11 amps), but it can vary based on the manufacturer, and the source of charge (solar regulator or inverter). If the current never declines to this point, then a timer will terminate the absorption stage, usually after 12 hours. Most battery experts will tell you that a level of 1 – 1.5 A per 100 Ah of battery rating indicates a full charge. Notice this is different than some inverter manufacturers. If your inverter allows selection of acceptance voltage algorithms, go with one that is consistent with your battery manufacturer’s recommendation. If you don’t have that information available, then use the inverter default for the battery bank size and type. Absorption charging restores the remaining 25% of the batteries capacity. Once you have your monitoring system in place, you can watch this process happen. It won’t take you long to get used to how your batteries are operating. The Float Stage starts at the termination of the absorption stage. Typically, the batteries are fully charged at this point. The purpose of the float stage is to maintain this full state of charge without causing battery gassing. The voltage is held at a constant 13.5 volts for flooded cell batteries, and 13.4 volts for gel types. Current is held at a low level, to maintain the voltage required. Higher current is available on demand to supply DC loads, but voltage is held at the float set point which is dependant on battery type. Some experts do not believe in a float stage, but most chargers force you into this stage. Some chargers allow you to set up a 2 stage charging algorithm that does not include a float stage. Other chargers, like the Outback, use multiple float stages, separated by a “quiet” time where the charger is not operating. We avoid an application of a constant float stage by only using our solar regulator for charging (normally, our battery charger is always "off" - we only turn it on when solar is not recharging our bank fully). This way, float only lasts during the daytime, and only when there is sufficient sunlight to support it. Most inverter/chargers have an equalization mode (as do many solar regulators). The purpose of equalization is to remove sulfates from the battery plates, and to break up stratification of the acid and water in the battery case, both of which occur over time in normal use. If successful, equalization results in all the cells specific gravity equalizing to a single value, thus the name. Usually, this is manually started on an inverter. On a solar regulator you can set up an automatic equalization cycle, or there may be a built-in mild equalization charge placed on the batteries at the start (in the morning) of each charge cycle. Only flooded cell batteries should be equalized. Placing an equalization charge on gel or AGM batteries will destroy them. Inverters and solar regulators have settings to prevent this from occurring. During equalization, up to 17 volts is placed on the batteries. This can damage sensitive electronics in the RV (such as refrigerator boards) so the batteries should be disconnected from the RV loads. For equalization to be effective at least 3 amps of current per 100 Ah of battery bank capacity must be available. From a practical perspective you have a choice of Wet-cell, gel, or AGM batteries. Wet-cell (golf cart and other types with removable caps) have a price advantage over gels and AGM batteries. They have the disadvantage of requiring regular maintenance, and proper venting of the fumes released by the gassing that occurs during charging. They can not be placed on their sides, since they are not sealed, and can not be placed in living spaces. Gel and AGM batteries are much more flexible in this regard – they can be placed on their sides, and anywhere in the RV, since they do not gas. They can also be placed in the same enclosure with the inverter. Battery gas is explosive, so wet cell batteries should never be placed in the same enclosure with the inverter (which can “spark” under the right circumstances). There is one really good reason not to use gels and AGM’s – price. They cost 3-4 times as much as flooded cell batteries. Since AGM batteries have become available, use of gel batteries is probably not a good idea. Gel batteries have to be charged at a much slower rate (C/20) to prevent gassing, they also need a lower voltage during charge. They can also loose water due to evaporation in hot climates (or enclosures). This shortens their life, since there is no provision to replace this water. AGM batteries have a glass mat that absorbs the acid/water mixture placed between their plates. Even if the case is punctured, they will not leak. They do not loose water, since it is automatically recombined with the acid during the charging cycle. Because of the construction, they are very resistant to vibration and impact (the glass mats cushion the plates), they can accept a full charge, just like wet-cell batteries. In fact, the internal resistance of AGM batteries is so low that they charge faster than other battery types. AGM batteries are ideally suited for RV use. They are far superior to flooded cell batteries, like golf cart batteries; they take charge at a much higher rate (ideal for solar and genset recharging), they survive shock and vibration better, no maintenance is required, they are sealed so you can put them anywhere (even on their sides, or inside your RV). But, and this is a big but, they are expensive. If you have never maintained a large house bank before, I highly recommend using the relatively inexpensive Sam’s Club batteries. They perform well for the money, and if you mess up you can replace them easily. Once you are used to battery maintenance and your energy needs are better known you can invest in higher performance batteries if you want. I’ve found that the Sam’s batteries last as long as the Trojans and perform almost as well. In use I see no significant difference. Concorde is the manufacturer of AGM batteries you see the most (they also make the Lifeline batteries). One you have estimated your electrical demand you can determine the size of the battery bank required to support your loads. For most RVer’s, a bank of four flooded cell batteries (like Trojan T-105s) will suffice. They will give you approximately 200 Ah of power if drawn down 50%. As discussed, you should try to only draw down 25% of your bank’s usable power. That would mean approximately 100 Ah would be available under normal conditions. If you need to draw them down further, then you can go to 50% DOD without concern. If your electrical demands are consistently 175 Ah or more, then you should consider expanding your bank size to six batteries. This will allow you the power you need without taxing your battery bank, and will prolong the life of your batteries. Another sizing consideration you need to consider during the design stage is balancing the battery capacity with the solar charging capacity. If your goal is to be able to recharge your bank from solar then you have to balance the solar and battery sizes. A general rule-of-thumb for optimal recharging is one watt of solar for one amphour of battery capacity. So four T-105 class batteries (400 Ah, rounded) are optimally charged by 400 watts of solar panels. Don't get obsessed with this - it is strictly a rule-of-thumb. In any case, you need to have a battery bank sized properly for your electrical demands. You can always add solar panels later, or use a generator to make up charge. The biggest issue with batteries is usually finding room for the size bank you need. Sometimes, it is not possible to install the ideal bank size because of space constraints. This means more generator run time, or reducing your electrical demand through conservation. Most 5th wheels have space for at least two batteries in the space the manufacturer supplied. Sometimes there is space for four, but rarely for six. Motorhomes sometimes have additional space available in the battery compartment, but can be more difficult than 5th wheels to find sufficient space. Batteries need to be located together, and in a vented space separate from the inverter and the solar regulator, both of which can generate sparks and arcs that could ignite battery gas. Sometimes you have to use your imagination to find a suitable location. In a 5th wheel you can move the batteries to the front storage compartment and put the inverter and solar regulator in side compartments, or in the main compartment. The inverter needs to be within 10-12 feet of the battery bank. You will also need space for fuses, shunts and other components involved in installation. Plan your location carefully, making sure that you can hook up all the required components. If you have to move the battery location you need to build a new battery box that has proper venting. I have used plastic storage containers for this with great success. Look in K-Mart, Wal-Mart and home centers to find a properly sized container. I use flexible vacuum cleaner hose for the vent line. Take the vent from the side of the box near the top; place a hole the same size as the vent on the opposite side of the box, near the bottom. Convection will assist with venting. Make sure that the box is secured, as well as the batteries within the box. Vibration and movement will kill your batteries very quickly by damaging the plates. Wiring the battery bank depends on the battery configuration. In a typical RV installation you need 12 volts to supply the house loads (we are ignoring busses for this discussion). That means you have to combine two 6-volt batteries in series to produce 12 volts. Pairs of 6-volt batteries are then combined in parallel to sum the amperage available, while maintaining 12 volts. If using 12-volt batteries you simply combine them in parallel. The size of wire used to interconnect the batteries depends on the maximum load to be drawn from them. The inverter will place the heaviest load on your battery bank. Your inverter manufacturer will tell you what size wire is required for the inverter, based on its distance from the bank. They usually specify that the battery interconnect wiring is to be the same size. If you "overbuild" the inverter feed wiring (by using, say, 4/0 wire when 2/0 would probably suffice) you can use the next size smaller to interconnect the battery bank. 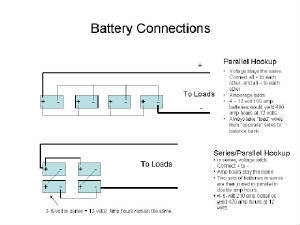 The battery interconnects have to be able to support the maximum load the inverter is capable of. Personally, I would never use less than 2/0 for interconecting batteries when an inverter is involved. The reason is that even if you have a small inverter now, if you go to a larger inverter you don't want to have to rewire the battery bank. Information on cable building is in the Truck Electrical Center section. You will be much better off building your own cables. Sometimes, in order to build the size bank required, you are forced to locate parts of the bank in different areas. While this is not desireable, if there is no alternative it can be done as long as you keep the distance between the batteries reasonable. For example, in our Royals International 5th wheel the battery box will support four T-105 class batteries. So that is what I have. However, if I needed to add two additional batteries I would place them just inside the nose storage compartment next to the battery box (which is on a slideout tray with an outside door). My inverter is also inside this nose compartment, on the opposite side of the RV. Normally, you NEVER put an inverter in the same compartment with a battery bank because of the possibility of expolsion. In this example it is safe to do so because of the separation and because this compartment also contains the genset, so it has excessive ventilation. I would still put the extra two batteries in their own box, and vent that box to the main battery box. Flooded-cell batteries require routine maintenance. This needs to be performed at least once a month. One of the advantages of gel and AGM batteries is that they are sealed units and do not require maintenance. Following is the maintenance information provided by Trojan. 1. Do not add water at this time. 2. Fill and drain the hydrometer 2 to 4 times before pulling out a sample. 3. There should be enough sample electrolyte in the hydrometer to completely support the float. 4. Take a reading, record it, and return the electrolyte back to the cell. 5. To check another cell, repeat the 3 steps above. 6. Check all cells in the battery. 7. Replace the vent caps and wipe off any electrolyte that might have been spilled. Subtract .004 for every 10o below 80o F.
10. Check the state of charge using Table 1. The readings should be at or above the factory specification of 1.277 ± .007. If any specific gravity readings register low, then follow the steps below. 1. Check and record voltage level(s). 2. Put battery(s) on a complete charge. 3. Take specific gravity readings again. 2. Perform equalization charge. Refer to the Equalizing section for the proper procedure. 1. The battery is old and approaching the end of its life. 2. The battery was left in a state of discharge too long. 3. Electrolyte was lost due to spillage or overflow. 4. A weak or bad cell is developing. 5. Battery was watered excessively previous to testing. Batteries in conditions 1 - 4 should be taken to a specialist for further evaluation or retired from service.